What is the deal exactly, with One Percent? We are a fully licensed real estate company that offers full service but at a discount commission. In terms of services and exposure, we are identical to whoever you would like to compare us with. We are on MLS®, all the top internet real estates sites, we place a sign on your property ( if it's allowed ), we show the property, hold open houses, advertise it, handle all the negotiations, plus the conveyancing. There is nothing that you are not getting, except for a high commission! We charge a total of $7,950 for residential properties under $700,000. 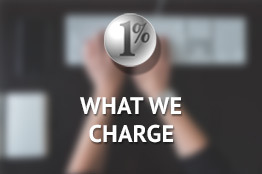 For residential properties over $700,000 we charge 1% of the sale price plus $950. Plus Applicable taxes, of course. We also offer the flexibility to offer more commission to the buyer's agent, if you want to. It is as simple as that! For commercial properties or farm properties please contact a One Percent agent directly or fill out the market evaluation form on the bottom right of our website pages and a One Percent agent will get back to you to discuss the particulars. Are your listings on MLS®, realtor.ca and shared across the web? What if a buyer has his own agent? Do I have to pay them? The $7,950 commission includes $3,500 of commission to whomever represents the Buyer. In a typical sale under $700,000 with 1% representing the Seller and the Buyer being represented by a Cooperating Brokerage: the 1% listing agent earns $3500, the cooperating Brokerage earns $3500, and the remaining $950 pays for the 1% agent's expenses in selling your home. As a matter of passing interest, over 80% of our listing sales in Ontario were sold by Cooperating outside agents through the Multiple Listing Service. If an agent tell you that our listings are not sold by other agents, they are simply lying. We have years of MLS® statistics across Canada to prove it. Can I offer the Buyer agent more than $3,500 (or 0.5% in homes over $700,000) on MLS®? Yes, if you want to offer more commission to the Buyer’s agent on MLS® than $3500 or 0.5% in homes over $700,000 – the choice is yours. We would still charge you the same fee for our listing portion of the commission and you could offer those Buyer’s agents a higher MLS® commission if you wanted to. Since we don’t believe offering any additional commission is necessary, if One Percent Realty sells your home ourselves without an outside Buyer agent we will only charge you $7950 for a home under $700,000 (or 1% + $950 for a home over $700,000). Our listings are shown by cooperating REALTORS® everyday just like other listings on MLS®. We cannot measure showings that we don't get. What we have seen across Canada over the years is that over 80% of our listings sales are sold by cooperating agents. Would they rather have more money? Of course-no argument. But the fact is, our listings are displayed everywhere that all the other listings are. All our listings are on MLS®, all the top internet sites, have a sign on the lawn, are in the real estate paper, and we do open houses. So if someone is looking for a home in your neighbourhood, in your price range, they are going to know it is for sale. That buyer is going to look at whatever is on the market before they make their decision. Buyers don't pay the real estate commission, so why would they care which house they buy? If their agent is unhappy with what we pay, the buyer will call us. But the fact is that the agents show & sell our listings, every single day. All of our sold signs over the years prove it! When you sign the standard MLS® listing contract with us, it lays out exactly the commission cost to you. If you are selling a Condo property, there are some Condo Association documents that will be required to provide in a sale. What if I want to do 'even more' advertising than my 1% agent's marketing plan? Since what we offer is full service real estate, it is quite rare for a Seller to request or pay any additional advertising from their 1% agent. That being said. you are in control of the advertising of your home. If you want additional advertising beyond the marketing plan of your 1% agent then great, but you will be responsible for the additional cost of such. 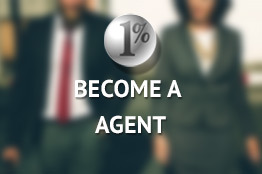 Your 1% agent will require your approval before spending such additional expenses. With your low commission structure, how do the 1% agents earn a living? These days with technology REALTORS® can work virtually and do not require the expensive office overhead of the past. Plus with our attractive full service commission rates our agents spend a lot less of their time and money prospecting for business and more of their time selling homes. With less office and advertising overhead and higher sales volume, they make a good living while saving their clients lots of money. I have been told that other agents sometimes ask for more commission than is being offered on MLS® with an offer. Can you respond to this. Buyer's agent, with the consent of the Buyer, can ask for additional commission with an offer. As the Seller you will decide what you wish to do with such a request - it is 100% your choice. Your 1% agent will explain to you that the vast majority of our Seller's decline to pay such requests and almost of all those offers still proceed normally. That being said, some of our Seller's decide it is in their best interest (i.e. they are happy with the offer as is) to pay some/all of the requested commission increase. Even in those situations, our Seller's still save a good deal of money on the listing side of the commission versus the more typical listing commission rates.